Friends of Sam Smith Park: IT'S WHIMBREL TIME AGAIN! At 5.30 a.m. this morning, members of the Toronto Ornithological Club (TOC) were at their post in Sam Smith for the annual “Whimbrel Watch” project. In the photograph are Jean Irons, Wayne Renaud and Don Barnett. 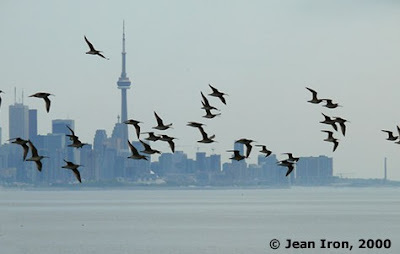 (Jean Irons' "famous" photo of whimbrels flying past Toronto adorns the front cover of the City's book "Birds of Toronto" which has been available free of charge at Toronto libraries). The T.O.C. coordinates observers and observation points to estimate the number of birds passing through the greater Toronto area during the period of peak passage. The most important point is in Sam Smith at the tip of the outer, eastern headland. Observers will be there all this week counting the groups of birds as they pass over. Everyone is welcome to come down and take part in the observation and learn about this fascinating bird. To date this year, about 700 have passed through from a group of about 6 000 that has wintered in the coastal marshes of Virginia. There, they have gorged on fiddler crabs using their specially adapted curved bills to extricate them from their hiding holes in the sandy shores. This year, 6 have been fitted with transmitters to monitor their non-stop migration from Virginia to their breeding grounds in the James Bay lowlands, a trip of 11 000 km in just about 24 hours. There is a receiver on the roof of the Lakeshore Yacht Club in the park to pick up signals. Go to this website to learn more about this tracking system used last year. Observers in Virginia tell the TOC how many set off at dusk from there and observers here in Toronto know how many to expect 10 hours later at dawn here. Most of the birds leaving Virginia are recorded passing through Toronto. 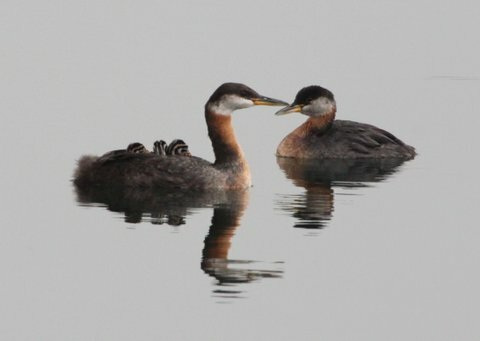 At the Sam Smith Spring Bird Festival this coming Saturday (May 29th), Toronto Region Conservation Authority will have a display to explain this interesting work. Better still, come and join the observers.